Marylyn Williams wants students who visit the cafeteria at Chavez High School to experience more than just food. She wants them to feel welcomed and at home. As the campus cafe manager, Williams believes she is responsible not only for serving appetizing meals but also for creating an environment that influences students for the better. Each day, she said, she makes it a point to greet every student with a smile, show them respect, and offer a listening ear. This entry was posted in District III - Sergio Lira, Food Services, High Schools, HISD: Our Story, Nutrition Services, Special events and tagged Chavez High School, Chavez HS, nutrition services, School Lunch Hero Day on May 2, 2018 by HISD Communications. Standing in a line that snaked across the school courtyard, hundreds of Chavez High School students shuffled under bright blue tailgate tents, eager to enjoy hot dogs, hamburgers, and chicken sandwiches. This entry was posted in Food Services, Health/Wellness, High Schools, News, Nutrition Services, Special events and tagged Chavez High School, Chavez HS, Spring Cookouts on April 25, 2018 by HISD Communications. Two Booker T. Washington students have become national ambassadors for successful SAT/PSAT prep by increasing their scores a combined 670 points, thanks to free practice tools available to every HISD student through Khan Academy. In mid-October, the CollegeBoard flew Valencia Grayson and Matthew Blue to the Council of the Great City Schools fall conference in Miami, where they were honored for their success with the Khan SAT prep. HISD Superintendent Richard Carranza also attended the conference, where HISD was recognized for actively promoting the Official SAT Practice on Khan Academy. This entry was posted in Achievement/Recognition, College Readiness, District II - Rhonda Skillern Jones, District III - Sergio Lira, District VIII - Diana Dávila, News and tagged Chavez HS, College Board, Eastwood Academy, Khan Academy, PSAT/NMSQT, SAT, SAT scores, Washington HS on October 27, 2016 by HISD Communications. Houston families stepped out into the sunshine for a productive, fun-filled day on Saturday at the “When I Grow Up Expo” at Hattie Mae White Educational Support Center. Approximately 6,000 people took advantage of the more than 100 exhibitors, including Exxon Mobil, Centerpoint Energy, and the Chavez High School Future Farmers of America (FFA) showcased hands-on career awareness and exploration activities. Face painters and food vendors maintained a party atmosphere. Students were encouraged to take part in numerous exercises designed to help them explore different career options. This entry was posted in Career/technical education (CTE), Magnet/School Choice, Special events and tagged Chavez HS, FFA, When I Grow Up on April 12, 2016 by HISD Communications. The Houston Independent School District Board of Education is searching for a new superintendent and trustees want input from community members about the qualities and traits they would like to see in their next district leader. HISD Board of Education President Manuel Rodríguez Jr. and Trustee Diana Dávila have scheduled seven meetings this week to gather feedback from the community that will be used to develop a superintendent candidate profile. The dates and times for additional meetings hosted by other trustees will be announced soon. This entry was posted in District III - Sergio Lira, District VIII - Diana Dávila, News, Superintendent Search and tagged Chavez HS, Edison MS, Hartman MS, Ortiz MS, Stevenson MS on February 22, 2016 by HISD Communications. 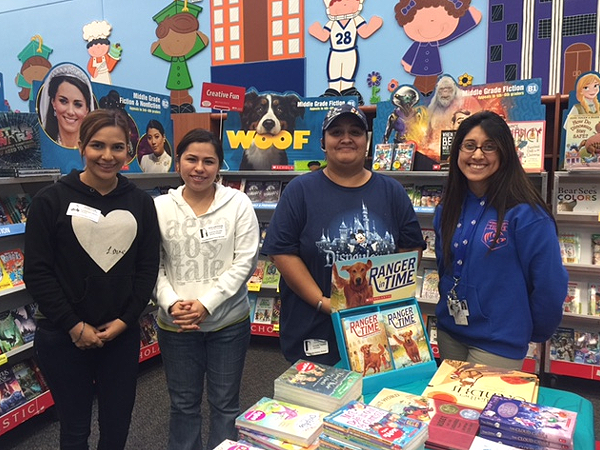 DeAnda ES parents (pictured) were able to purchase books at discounted prices from local retailers after obtaining library cards from the Houston Public Library, thanks to a special arrangement made by Principal Erwin Garcia Velazquez. Last month, HISD began honoring district campuses for their successful implementation of the Family Friendly Schools program. Now, four more campuses have been recognized by the Family and Community Engagement (FACE) Department for their efforts to make parents feel welcome and valued at their children’s schools. This entry was posted in Achievement/Recognition, District I - Elizabeth Santos, District III - Sergio Lira, District VIII - Diana Dávila, FACE, News, Parents and tagged Chavez HS, DeAnda ES, Family Friendly Schools, Herrera ES, Jackson MS on February 12, 2016 by HISD Communications. Students at Lanier Middle School screamed in excitement as they learned that Lanier came in first in the U.S.—beating more than 16,000 schools—in Vocabulary.com’s December Vocabulary Bowl. The annual Vocabulary Bowl pits schools against one another in a friendly competition of word mastery. Students log onto the interactive learning game, select their grade level, and learn the meaning of words they may never have seen before. Teachers can also create vocabulary lists based on reading students have done in class. This entry was posted in Achievement/Recognition, District IV - Jolanda Jones, Literacy, Middle Schools, News and tagged Chavez HS, Lanier MS, Vocabulary Bowl on February 1, 2016 by HISD Communications. Grandmaster Timur Gareev will be trying to break a world record soon by playing the largest number of simultaneous chess games ever while blindfolded — and 10 students from HISD schools recently helped him prepare for that challenge. This entry was posted in District II - Rhonda Skillern Jones, District III - Sergio Lira, District VIII - Diana Dávila, High Schools, Middle Schools and tagged Chavez HS, chess, Furr HS, Leland College Preparatory High School, McReynolds MS on September 23, 2015 by HISD Communications. Twenty-eight students in HISD’s English Language Learner and migrant programs spent two weeks of their summer participating in hands-on science, technology, engineering, and math (STEM) activities at the STEM Leadership and Design Fabrication Academy at Rice University. This entry was posted in District I - Elizabeth Santos, District II - Rhonda Skillern Jones, District III - Sergio Lira, District VI - Holly Maria Flynn Vilaseca, District VII - Anne Sung, District VIII - Diana Dávila, High Schools, Volunteers and partnerships and tagged Austin HS, Chavez HS, Davis HS, Furr HS, Kashmere HS, Lee HS, Liberty HS, linked learning, Sam Houston HS, Sharpstown HS, SHMSTC, Waltrip HS on July 27, 2015 by HISD Communications. 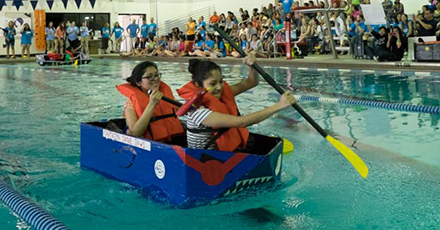 Thinking up a concept, executing its design, and thrilling in its success—or learning from its failure—that’s what the Cardboard Boat Regatta at Chávez High School is all about. Eleven teams comprised of sophomore, junior and senior girls, with mentoring assistance from Rice University graduate students, GE Oil & Gas volunteers, and Chávez HS faculty, raced cardboard boats of their own design on June 25 in the new signature event of the three-year-old Rice University Institute of Biosciences and Bioengineering (IBB) Girls STEM Initiative. This entry was posted in District III - Sergio Lira, STEM and tagged Chavez HS, Rice University on June 30, 2015 by HISD Communications.